My finished drawing of this cute kitten I have called Buttons. This drawing is being submitted to the BSPCA – Bahrain Society for the Prevention of Cruelty to Animals for submission to an e-book and, if successfully chosen, 2015 calendar to help raise money for their charity. Thank you to P Moll for the use of the original photograph. Another little update of this kitty. Will spend the next few hours on it and hope to finish today! So this is the start of a cute kitten – ‘Buttons’. Oh, how I love my new coloured pencils – how sad is that? Thank you to PMoll for the use of the original photo. 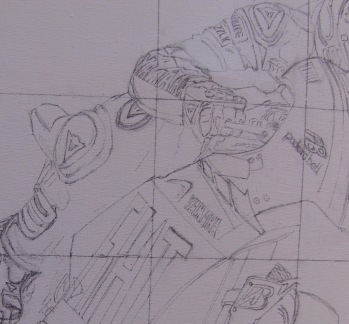 Who is on My Drawing Board? The paints are now out, but who is on my drawing board?